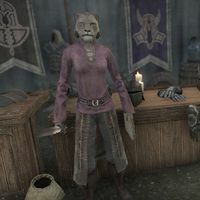 Bishanti is a Khajiit armorer selling her wares at her stall, Polished Protection, in Velyn Harbor. She is one of the citizens you are asked to rescue during the liberation of the town. Once that is done, she will remark on how swiftly things are returning to normal before offering her wares: "Trade's picking up in the harbor, isn't it?" "I can't believe it. I'm going to lose everything!" Get to the Fighters Guild. Lieutenant Ehran needs help fighting the invaders. "Fight? I don't even know how to hold a weapon! What can I do?" You can fight beside the Fists of Thalmor and take back Velyn Harbor. "The Fists of Thalmor? I thought they abandoned Velyn Harbor! If they're still here, maybe there's a chance. All right, I'll help." "I'll do whatever the Lieutenant says, so long as Velyn Harbor is saved." "The lieutenant died for Velyn Harbor. The sergeant taught us to fight for ourselves. Maybe it's time we stepped up and helped out more." This page was last modified on 8 December 2018, at 00:14.